Women will decide the EU referendum – so why are the campaigns so blokeish? Women voters have the power to decide the EU referendum, write Deborah Mattinson and Sunder Katwala – if they choose to take it. Both referendum campaigns will need to persuade women voters if they want to win. That’s partly due to the simple demographic fact that there are one million more women than men in Britain, mainly because of the gender gap in life expectancy; but it is also reflects the fact that women are considerably more likely to be undecided about Europe. Research shows that on the issue of Britain’s EU membership, women are more open to changing their minds than men and also less certain whether or not to take part. 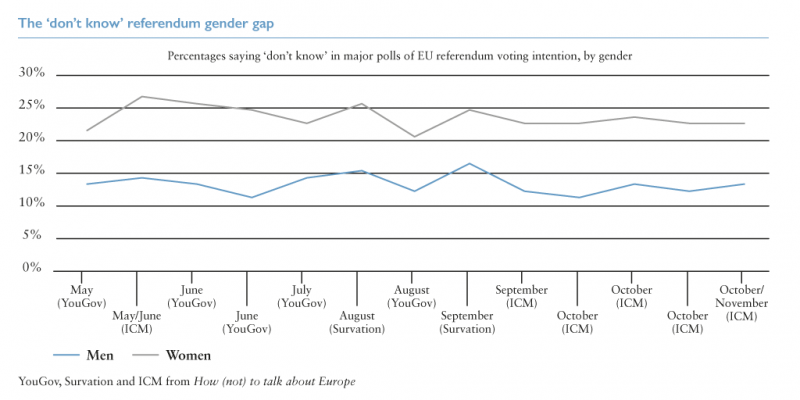 In most polls on the referendum question, just over 10 to 15% of men say they don’t know how they will vote. For women that figure nearly doubles: 20-25% of them aren’t sure. • Women are almost twice as likely to answer ‘Don’t Know’ in most EU referendum polls. • Women are less likely to say they are certain to vote in the referendum: 43% of men are certain which way they will vote, whether that’s ‘In’ or ‘Out’; that drops to just 29% of women. • Women are considerably less persuaded by UKIP, and have been less likely to vote for them. When asked how much they trust a series of different politicians when they talk about Britain’s membership of the EU, 41% of men say they trust Nigel Farage, but only 31% of women agree. • Intriguingly, evidence suggests that women may be more Eurosceptic than men, and more difficult to persuade to vote for Leave. When I listen to women talking about the Europe debate, what strikes me is their frustration at the way the different arguments are shaping up. They know this is an important decision, and want more information so they can make that choice when the referendum comes. But nobody really seems to be talking about what matters to them. We know that women are undecided about the EU Referendum. They’re less likely than men to express certainty on a whole range of issues. Crucially though, they’re no less likely to vote – in fact there are more women voters than men. So there are millions of women’s votes potentially up for grabs in the referendum. It’s remarkable that the two campaigns aren’t making more effort to go after them. Voters will have heard very few female voices in the referendum campaign so far. One would hope that changes once the competing campaigns step up their outreach to the public. At the moment it all sounds removed from reality. The pro-European case looks like men in suits reeling off GDP figures and economic studies in a very abstract way that’s quite alien to how most people think about the economy; the Eurosceptics can sound obsessed, as if anybody who didn’t read every clause of every Treaty since Maastricht has no right to hold an opinion. None of that is really going to strike a chord with women voters. In fact none of it is going to strike much of a chord with ordinary members of the public in general. Public voices on both sides of the EU debate are going to have to make their arguments much more ‘human-friendly’ if they want to win the support of undecided voters. We know, for example, that the ‘stay’ arguments are much more effective when related to the personal level – talking about potential job losses rather than impacts on trade and investment. For women these arguments are even more effective when framed in terms of job security for current and future generations, playing in to existing concerns about their children and grandchildren’s prospects. Similarly, on opposing side, we see that the immigration argument packs the most punch when it relates to the impact of immigration on public services in voters’ own localities, including ever growing pressure on schools and hospitals. Each side is going to have to work much harder to make the ‘human’ case, but it’s even more true for women voters – who may well decide the outcome of the referendum. The evidence suggests both sides of the big Europe argument have struggled to find the voice that makes sense to most women. The EU institutions remain dominated by middle-aged men in suits. The presidents of the Commission, the Eurogroup, the Central Bank and the European Parliament are all men. Indeed, every President of the European Commission to date has been male. The elected Parliament, which might be expected to do a bit better, last elected a woman president over a decade ago in 2002. Britain’s public debate about the European Union has been a very blokeish affair too. The 1975 campaigns reflected the male-dominated politics of the day, with only one or two women playing a prominent role. Forty years on, the country will surely expect the campaigns to be different. A glance at the most prominent voices in the opposing ‘In’ and ‘Out’ camps, however, is likely to leave them disappointed, with only Laura Sandys of the pro-EU European Movement and Kate Hoey of the Eurosceptic Labour for Britain standing out in a sea of male (and white) faces. Both, however, will need to do more than increase female representation among their spokespeople if they want to reach women voters. The rival campaigns should be developing approaches that specifically appeal to particular groups of women whose votes may be ‘up for grabs’ to them. The ‘Leave’ campaign has a challenge of persuading those women who are critical of the European Union to believe it is worth taking the risk to leave. Across Europe, academic studies show that women are, if anything, mildly more sceptical towards European integration than men – with bigger gender gaps in Britain, Ireland and Nordic countries than elsewhere. Yet we know from repeated UK polls that they are less likely to support populist Eurosceptic parties; and comparative studies also show that women are somewhat more likely to support the ‘status quo’ in referendums – with one theory being that women are more risk-averse. The ‘In’ campaign faces a different challenge, one of mobilising women who are not particularly Eurosceptic and would be more likely to vote ‘In’ than ‘Out’ if they voted – but who may not feel that the issue matters enough to them to turn out. They may face a similar challenge with younger voters, too. For both groups, macroeconomic figures about the value to GDP, or arguments about the Norwegian model, are unlikely to convince them that EU membership, In or Out, has a big impact on their everyday life. In fact, for many voters, the only way they see the EU affecting them is by allowing higher levels of immigration than they would like, through free movement. The politics of gender are not fixed – and gender gaps have changed direction, significantly, over time in British politics. The Conservatives were the main beneficiary, across most of the post-war period, of the initial extension of suffrage to women. That pattern was reversed in the 1990s, with Labour doing better than the Conservatives. Today, there are divergent patterns among different women voters: younger women are more likely than younger men to vote left; older women are more likely than older men to vote right. The lesson for the EU referendum of those shifting patterns is that there is no political destiny in demographics – it depends on the arguments that the campaigns make about what is at stake and why. The votes of women may be decisive in the referendum and they are up for grabs for both sides. Yet neither campaign seems to be making any kind of sustained bid to secure them. This article is an extract from ‘How (not) to talk about Europe’ by Sunder Katwala and Steve Ballinger, published by British Future on Wednesday 6 January 2016.